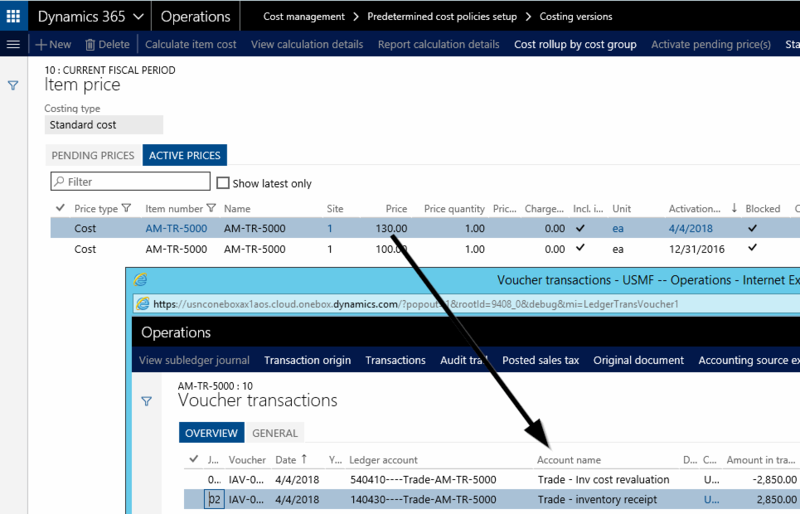 After having analyzed how to deal with purchase price variances in order to arrive at a second (parallel) inventory value, let’s have a look at the second standard cost variance type – the inventory cost revaluation – and how to deal with those variances to obtain a second (parallel) inventory value for standard cost items. At the end of a fiscal year, the standard costs of a first item are adjusted from $100 to $109. For a second standard cost item, the standard costs are adjusted from $100 to $95. As there are currently 100 pcs from each of the items on stock, a total inventory value of $20000 can be identified (before adjusting the standard cost prices) in the financial statements illustrated in the next figure. For reasons of simplicity the inventory values/balances have been created by posting an inventory adjustment journal that resulted in an inventory receipt & profit transaction. The aforementioned revaluation of the standard cost item is realized by recording and activating the new standard cost prices in the standard cost costing version, as exemplified in the next screen print. Once the new standard cost prices are activated, the financial statements show a $400 higher inventory value. This can be identified from the next figure. The overall increase in the inventory value can be explained by the value increase of the first standard cost item [($109-$100) x 100 pcs] and the value decrease of the second standard cost item [($95-$100) x 100 pcs]. If the revalued items will be sold subsequently, the newly activated standard cost prices will be used for posting the issue transactions. 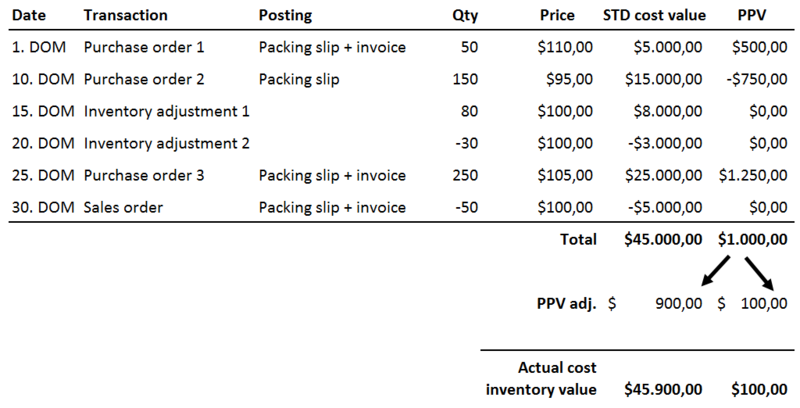 At this point the question arises whether the inventory cost revaluation amount can remain in the income statement as illustrated in the previous screen print or whether an adjustment similar to the one that has been shown in the first part for the purchase price variance (PPV) is required in order to get a second (parallel) inventory value? This question can be answered by stating that no split and allocation of the cost revaluation is required, if the cost revaluation is done in a way to adjust the standard cost prices to an ‘actual’ market price. If this is the case, any previously recorded adjustment and allocation of the PPV needs to be reversed in order to avoid an over-adjustment of inventory values towards actual market prices/values. In practice, most companies do not adjust their standard cost prices in a way to reflect ‘actual’ (market) cost prices. Otherwise, they would have chosen an alternative actual cost price valuation model right from the beginning. Against the background of this common adjustment behavior, it can be argued that an adjustment of the recorded standard cost revaluation amount is necessary in order to arrive at an approximated actual inventory cost price. The main question in this context is then how such an adjustment can be realized? From the authors’ perspective, the complete cost revaluation amount needs to be shifted (allocated) from the income statement to the balance sheet in order to arrive at an actual cost valuation amount. That is because only those items that are currently on stock (or in process) – that is receipt transactions – are affected by the cost change variance. If those items are sold or consumed later on the adjusted higher/lower standard cost price will ensure that the cost revaluation amount that has been allocated to the balance sheet is successively eliminated. For that reason no split up and allocation of the cost revaluation amount is necessary. The next part of this series continues with analyzing cost change variances and how they need to be incorporated into this parallel inventory valuation approach. The previous post dealt primarily with the question how the selection and posting of journals can be restricted. Within this post I would like to change the perspective and take a look at a function that allows a periodic posting of a number of journals that have been created. 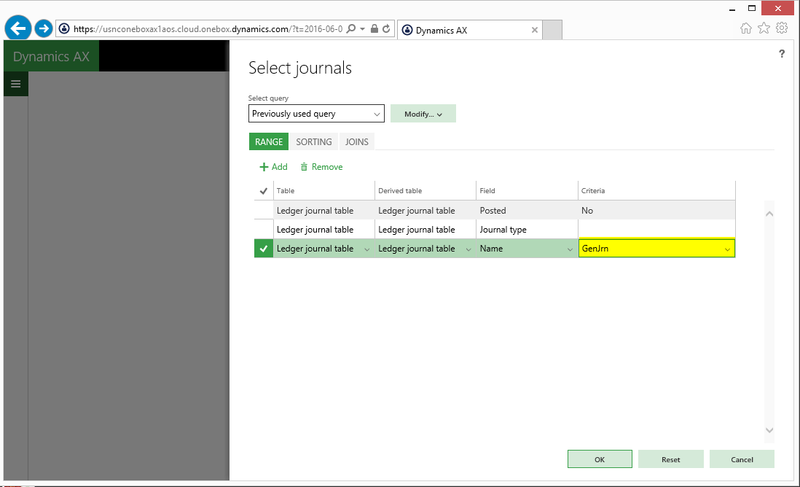 The “post journals” functionality I refer to here can be found in the General Ledger module in the journal entries section. 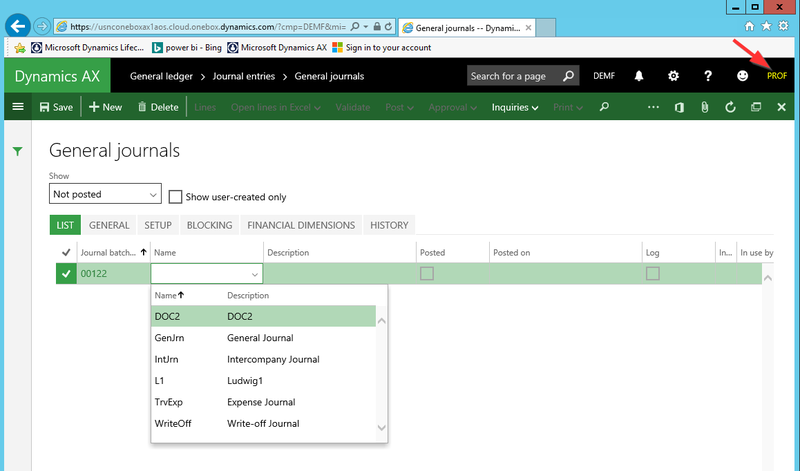 (In prior Dynamics AX versions it can be found in the periodic General Ledger module section). As the information that has been provided e.g. 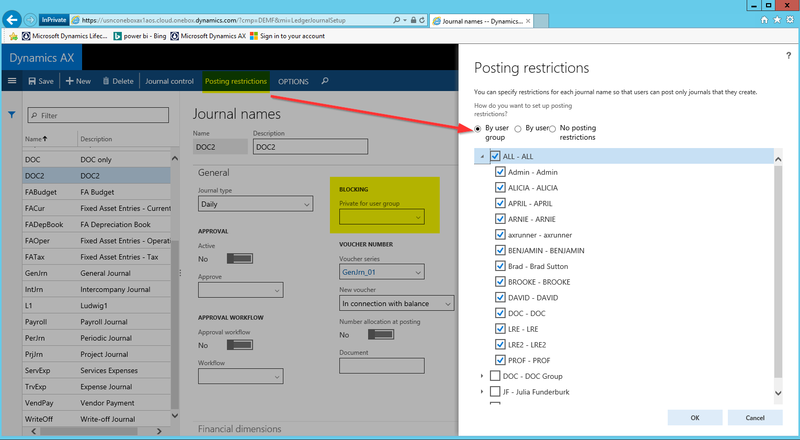 on TechNet for the “post journals” functionality is a bit sparse and as several questions in regards to this function have been brought forward recently, I decided summarizing the different setup and processing options in this post. Note: Please note that the following illustrations and explanations will only refer to posting General Ledger journals. The post journals function is, however, not limited to those kind of journals but can be applied to other journals as well. Please see the following summary. 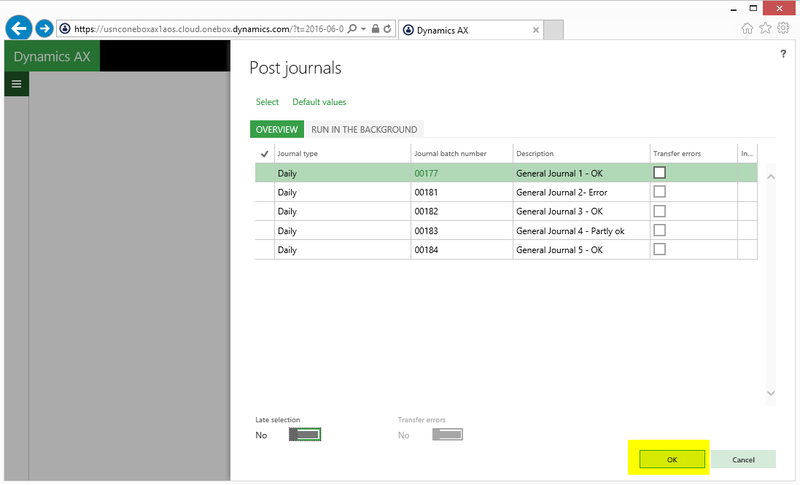 In order to explain the different setup options of the post journals feature, I started setting up some daily General Ledger journals that included either no error (“OK”), some journal lines with errors (“Partly ok”) or only erroneous lines (“Error”). 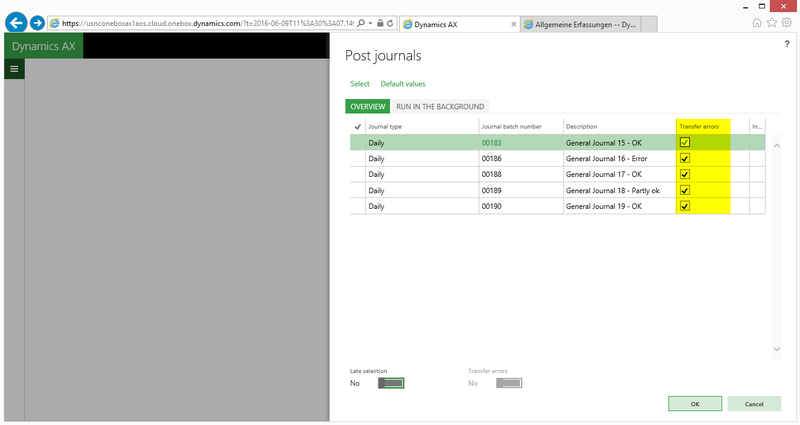 The next screenshot exemplifies the setup of some of those journals used. Once all demo journals have been prepared, I opened the post journals window and selected them through the identic button. After all journals have been selected, the posting process was initiated by hitting OK button in the post journal form. 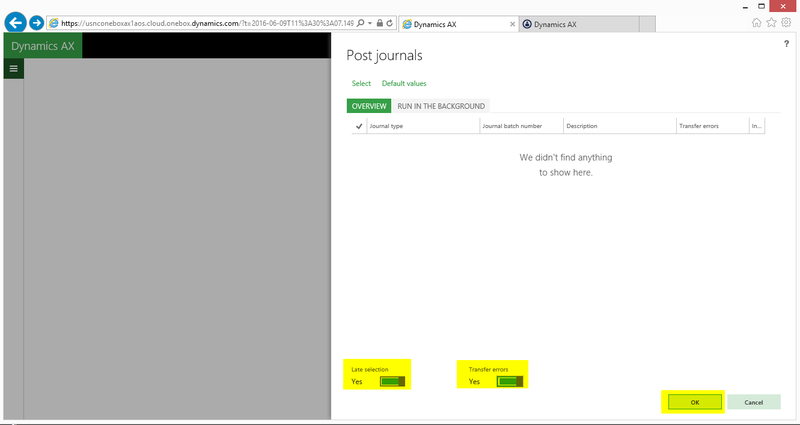 The result of this first posting test was that all journals except the ones that contained errors were posted. Newly created journals that did not contain any error remained, however, unposted. 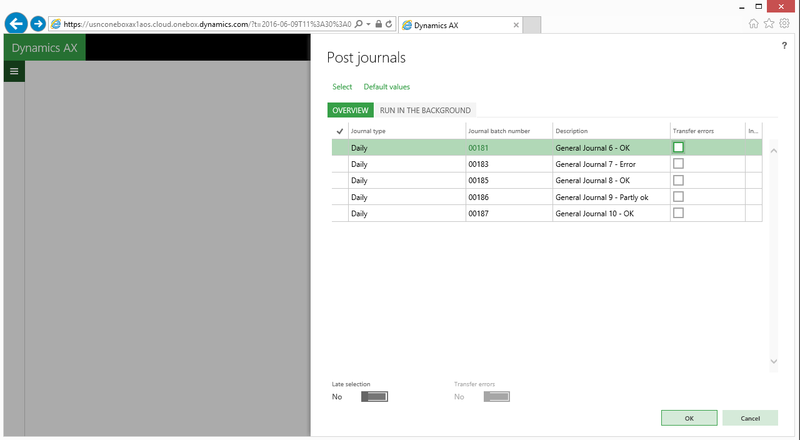 To get also those journals automatically posted that have been created later on, I deleted all unposted previously generated journals, setup some new ones and selected them as before in the post journals form. This time I changed the posting process by making use of a batch process that runs every some minutes and that does the posting for me. 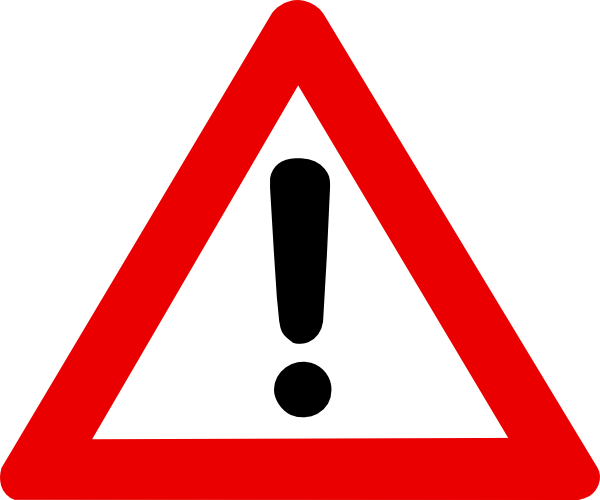 As before, all journals have been posted except the ones that contained errors. My next step was setting up a new journal (No. 188) that did not contain any error. 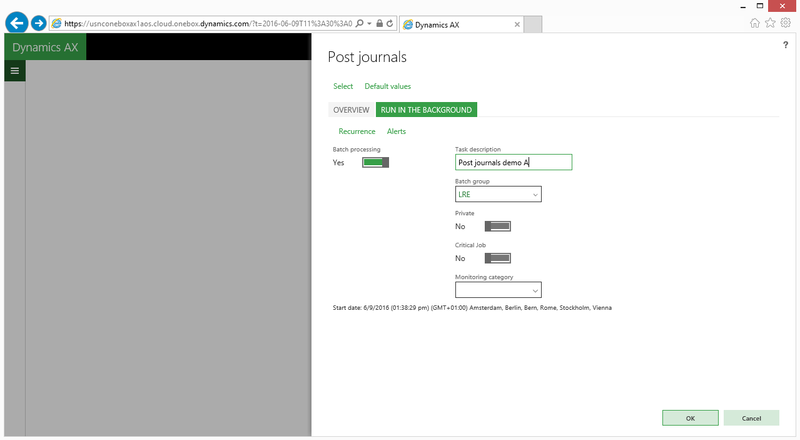 Because of my posting setup I expected that the batch process will pick up the newly generated journal and post it. 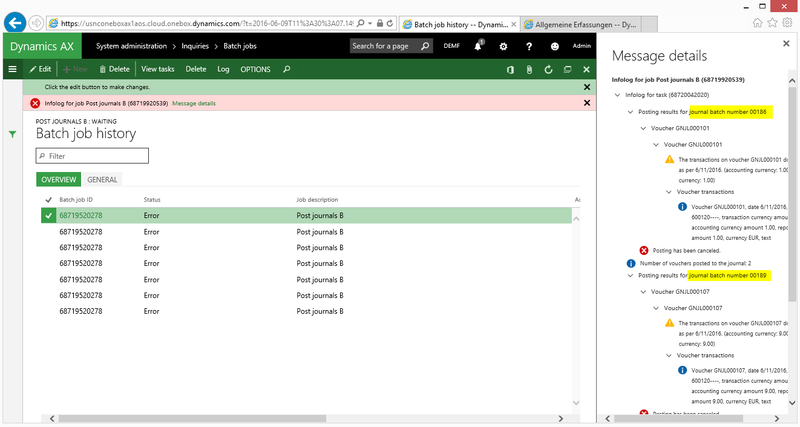 Yet, as nothing happened, I finally checked the batch job history window and noticed that the batch job stopped because it could not process the first two journals that contained erroneous lines. Please see the next screen-print. As processing newly created journals did not work with the previous approach, I repeated the earlier setup steps and created a number of new journals. This time I tried processing them by selecting the ‘transfer errors’ checkboxes (please see below). As expected, all journals except the ones that contained errors were posted. After setting up a new journal that contained no error I expected that this time the newly created journal will be posted. Yet, unfortunately nothing happened to the newly created journal as the batch job stopped as before after detecting errors. Note: The difference between the 2nd and 3rd setup option is related to the journal that was partly ok. That is, this time all journal lines that did not include an error in the original (partly correct) journal No. 189 were posted and the journal lines that contained errors were transferred to a new journal No. 191 that contains only the erroneous lines. 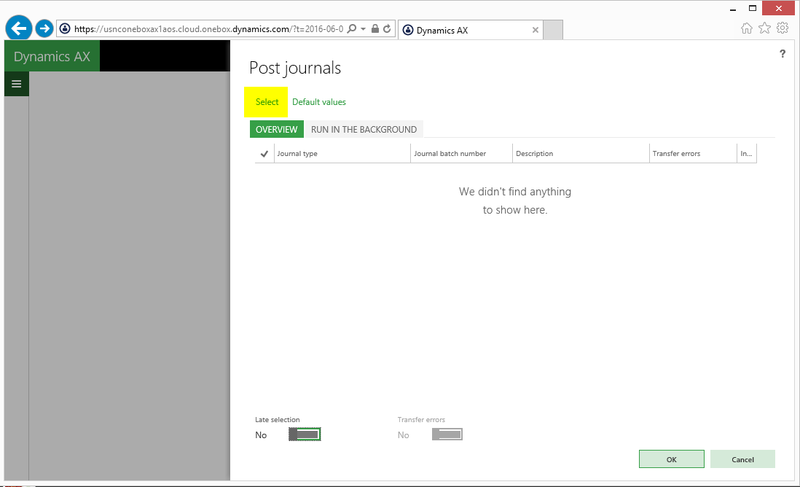 Since none of the prior setup options successfully posted the journals that I created subsequently, I changed the setup in the post journals form once again. This time – after selecting the journals that I want to post – the “late selection” and “transfer error” parameters were activated as shown in the next screen-print. This time all erroneous journals/journal lines remained unposted as before but the journal that I created later on – in my case journal No. 196 – was finally picked up by the batch process and posted automatically as the following screen-prints prove. Note: Despite the fact that the newly generated journal was successfully posted, the batch job still continued running (and ending) with errors because of the two journals that contained lines with errors. Even though this issue in not directly related to the journal posting process itself, it can become quite cumbersome, as it might flood your mailbox with error messages / Emails if alerts and/or Email notifications have been setup that control the processing of batch jobs. Probably the most complex part when it comes to setting up the COS and NOE method in parallel is related to the production of goods. That is mainly because the production posting setup does not only require a setup of the inventory posting matrix but – depending on the parameter setup – also makes use of other accounts that are setup e.g. at the resource level, production category level and in the costing sheet. It is not feasible showing you all possible ways for setting up production related postings. Rather than trying to do that I will exemplify the setup based on a simple production item. You can use this basic setup then and apply it to more complex production scenarios. To keep things as simple as possible, I do not create transactions that result in production related variances e.g. due to additional raw material consumption, changed execution times and so on. All production postings illustrated in the following are based on the ledger principle “item and resource” that can be found in the production control parameters form. 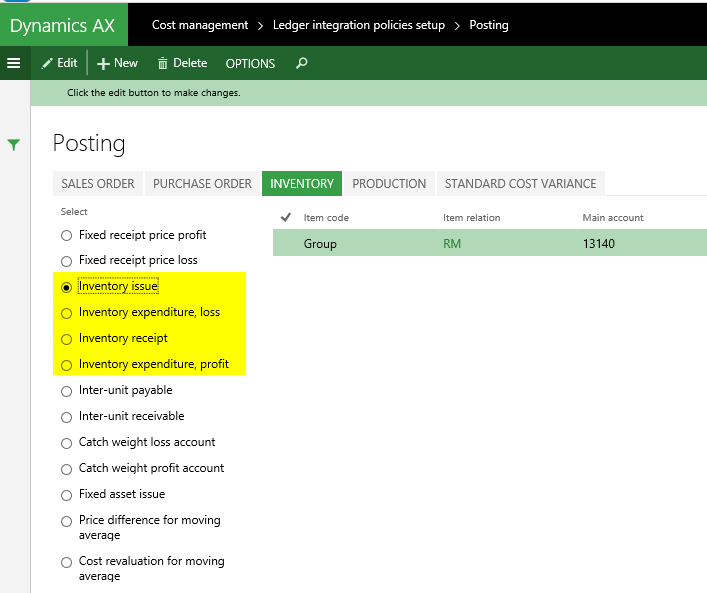 Irrespective of the specific ledger setup for production related postings, the basic production process in Dynamics AX follows a three step procedure that begins with the start of a production order, continues with reporting the production order as finished and finally ends with the closing or “costing” of the production order. Those basic production steps and the related postings executed are illustrated in the next diagram, which will be used as a guideline for the subsequent illustration of the production related postings for a production item. The structure of the production item I referred to above can be identified in the next screen-print. The cost price calculation screen shown above illustrates that the production item (FG2000) consists of two raw materials (RM300 and RM400) that have a cost price of 10 EUR / pcs each. For the production of this good one piece of the first raw material (RM300) and two pieces of the second raw material (RM400) are required. In addition, for the assembly of the product a worker has to work one hour on a machine that has a total cost price of 270 EUR / hour. Based on those data a total production cost price for the production item of 300 EUR / pcs arises. For reasons of simplicity, the production parameters used in this example have been setup in a way that the material consumption (BOM) and route consumption are immediately posted when the production is started. 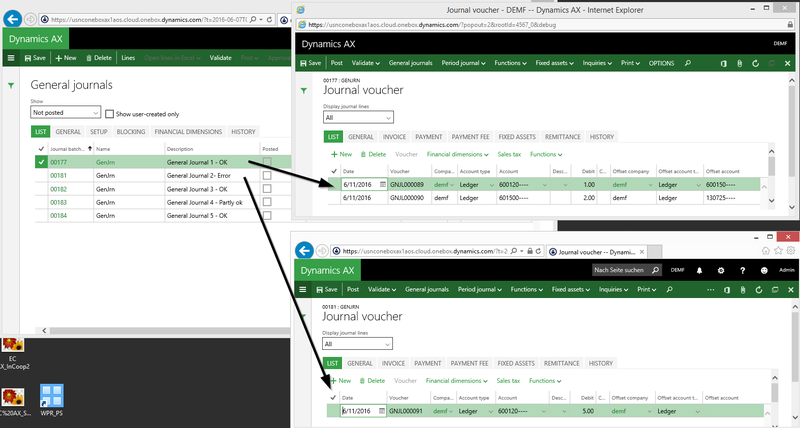 The next screen-print shows the vouchers that have been created through the posting of the BOM and route journals. The effect that these vouchers have on the financial statements of the company can be identified in the next illustration. From a Balance Sheet perspective, the production start related postings are reflected in changes that can be observed on the WIP accounts no. 13430 and 13440. 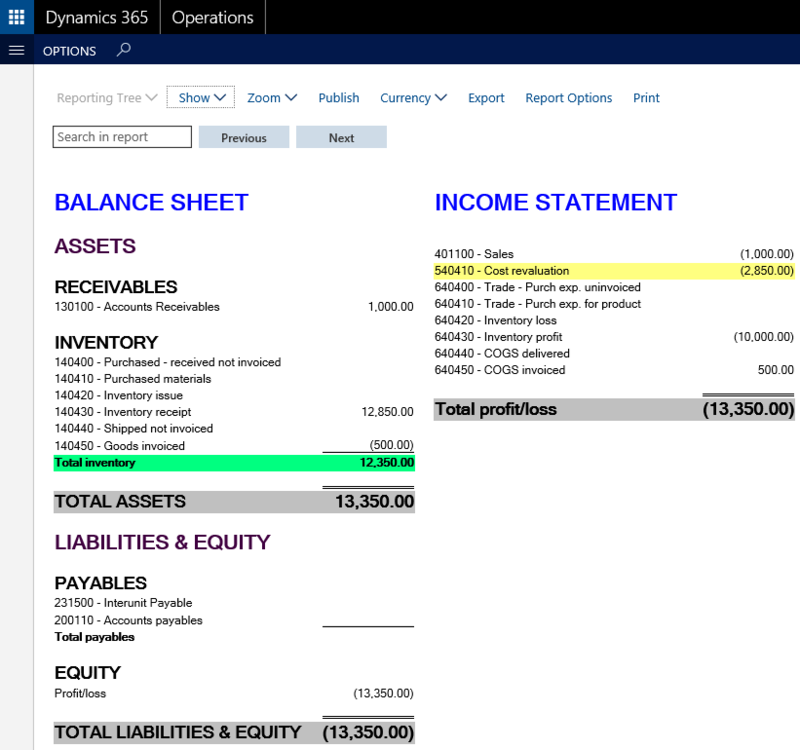 For the raw material consumption another Balance Sheet account (no. 13150) has been used as the offset account and the offset account for the route consumption has been posted on an Income Statement account (no. 60110). Given that the NOE accounting method typically uses stock variation accounts for each and every change recorded in the company’s stock level, the question arises how the raw material related postings that were executed with the start of the production order can be explained / justified? I will try answering this question based on the following illustration that shows the recorded accounting transactions in the upper part and the missing “in between” stock variation accounts in pink color in the lower part. What becomes obvious from this illustration is that the approach followed here is not fully correct in the sense that the pink transactions highlighted above are missing. An important question at this point is whether those missing transactions result in a critically wrong illustration of a company’s financial position or not. 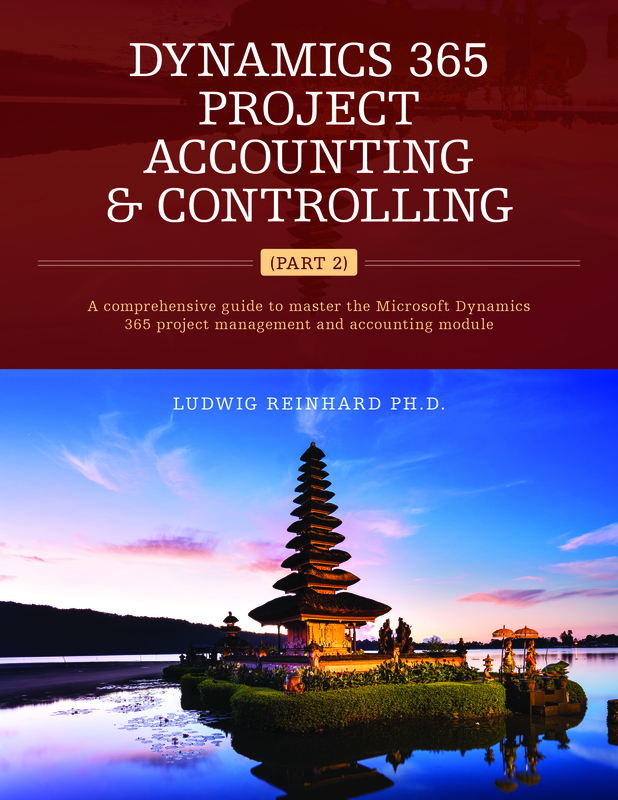 From the author’s perspective the “missing” pink transactions are not critically important as they do not distort the financial position of a company that follows the NOE accounting method. That is because the NOE Income Statement does on the one hand side summarize all stock variation transactions into a single line. On the other hand side, one has to remember that the pink highlighted lines add up to zero and do thus have no impact on the company’s financial position. The second transaction I would like to discuss in more detail here is the route related voucher that credits an Income Statement account (no. 60110 “production wages clearing”) and thus affects the profit of the company. 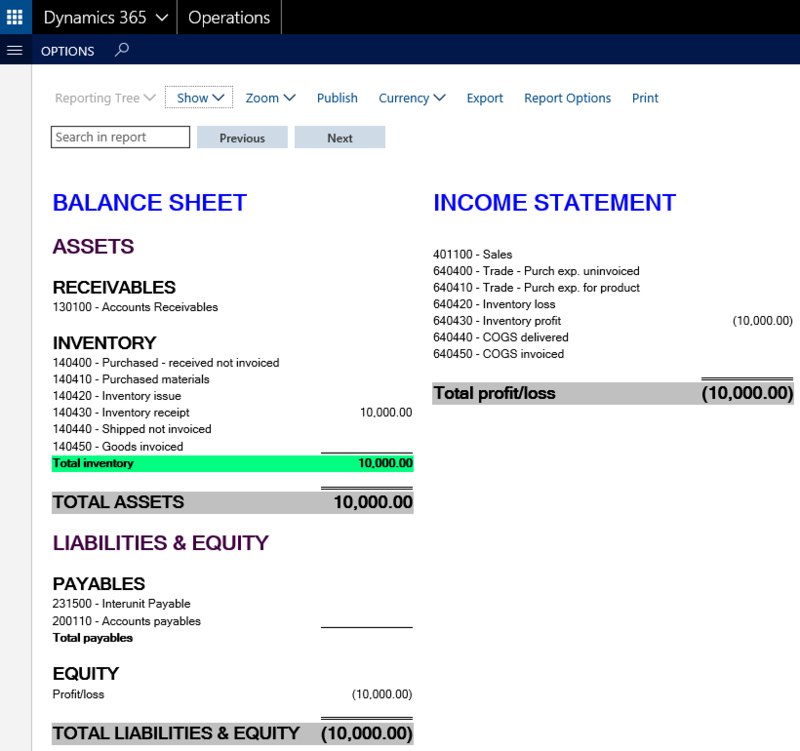 From a NOE accounting perspective this account / transaction can be explained by stating that the clearing account used represents a part of the stock variation of the company. In other words, the increase in semi-finished products for the route consumption part on account no. 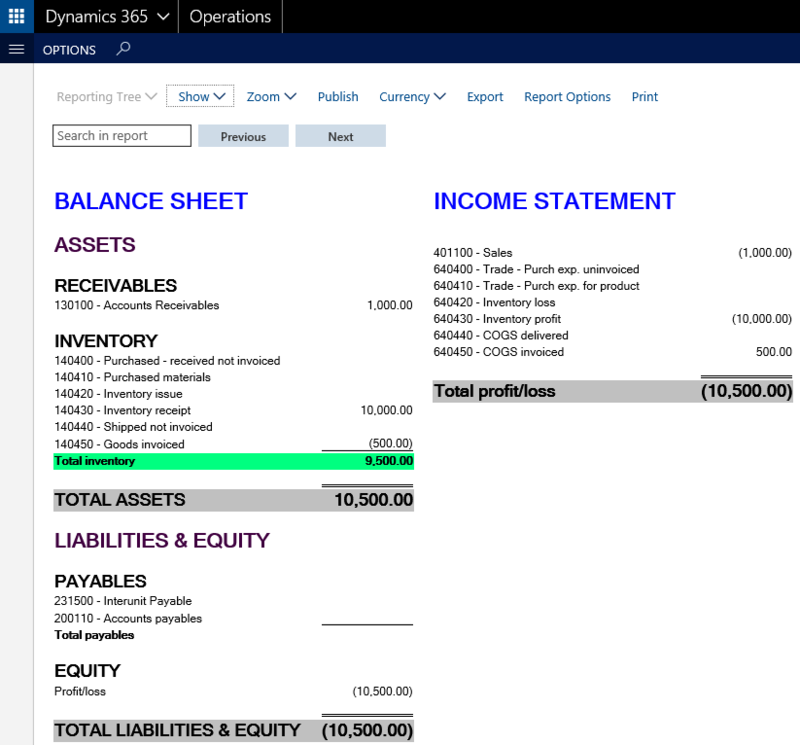 13440 is offset by the “stock variation” recorded on account no. 60110. 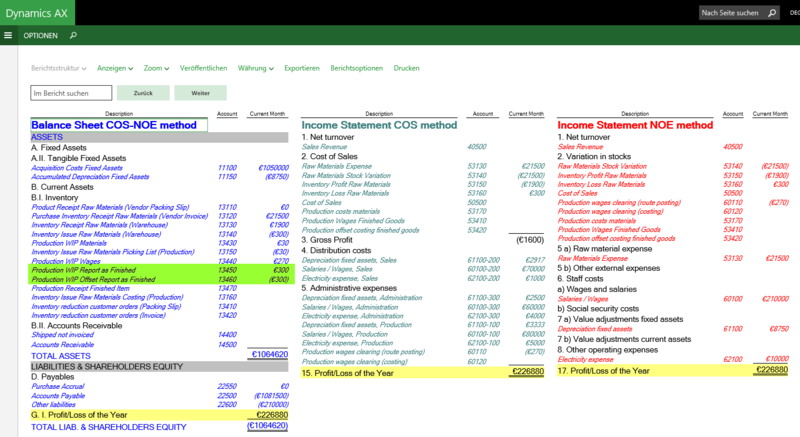 For that reason, the production wage clearing account has been assigned to the stock variation section in the Income Statement that follows the NOE accounting method. 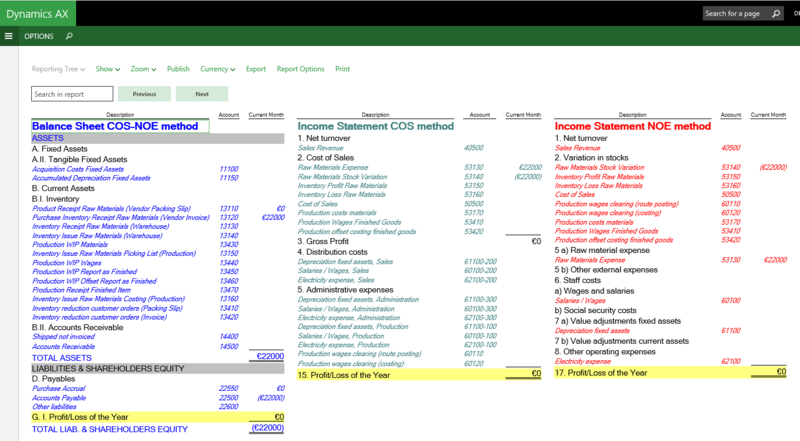 If you take a look at the Income Statement that follows the COS method, you can identify that the very same account no. 60110 has been included in the section that incorporates the production wages recorded before. Irrespective of the whether the name and the section where those accounts have been assigned to is correct, the question that arises how one can justify the assignment of the production wages clearing account there? From the authors perspective this assignment can be justified by interpreting the transaction recorded on the production wages clearing account as a kind of allocation that shifts a part of the total production wages from the company’s Income Statement into its Balance Sheet. Stated differently, the production salary / wages posting recorded before immediately reduces a company’s profit. The start of the production on the other hand side creates a tangible value for the company in form of a (semi-) finished product and thus increases its overall wealth. This wealth increase is reflected on account no. 60110 in the company’s Income Statement. The next production step consists of reporting the production as finished. Executing this production step results in the following voucher that debits and credits a Balance Sheet account with the total production cost amount of the item. As only Balance Sheet Accounts are used for recording the RAF transaction, no difference between the COS and NOE method arises. The last production step ends the production order and ensures that the realized production costs get posted. 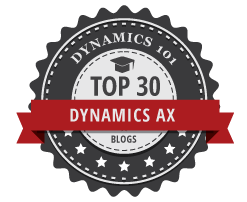 Dynamics AX realizes this by reversing and replacing all prior production postings that have been recorded based on planned cost values with postings that are based on realized ones, that is, actual cost values. 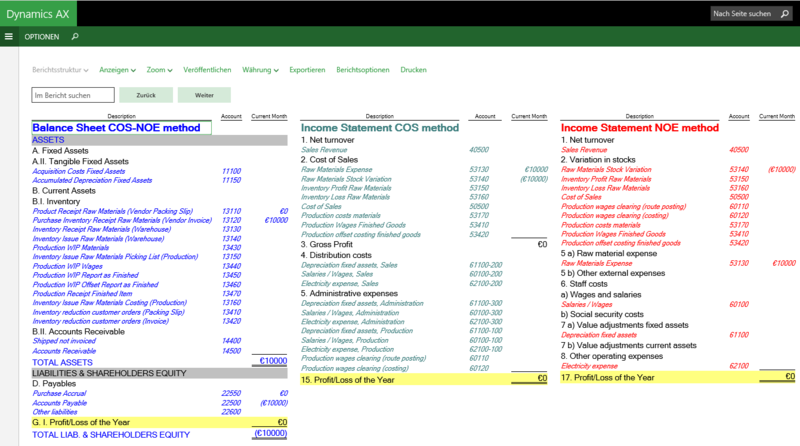 In the example used, the following costing voucher results. Note: The lines that have been selected in the prior screen-print reverse the prior postings that have been created during the first two production steps. 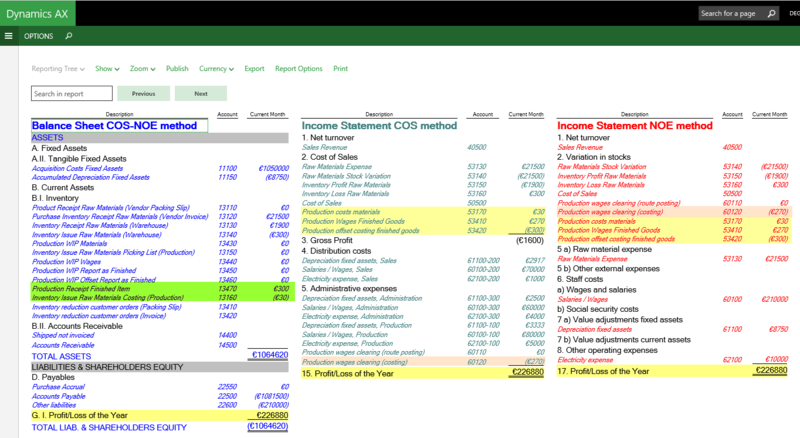 The outcome of the production postings generated can be identified in the financial statements illustrated next. * The amount of 300 EUR recorded on ledger account 13470 represents the stock increase resulting from the production of the finished good. * The negative amount of 30 EUR that Dynamics AX credits on ledger account no. 13160 represents the reduction in raw materials that have been used for producing the finished good. * The three ledger accounts no. 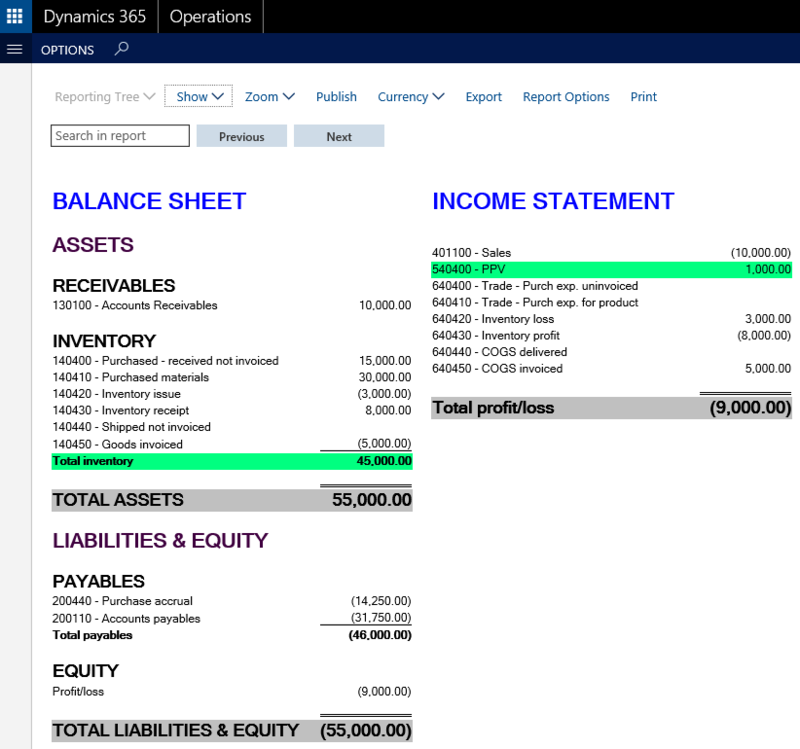 53420, 53410 and 53170 are Income Statement accounts that – from an overall perspective – offset each other. That is, the total amount posted on those accounts adds up to 0 EUR. * A first reason why these accounts were setup this way is to get the production costs – of 270 EUR for the production worker and 30 EUR for the raw materials consumed – transferred into the cost accounting module for subsequent cost analysis. 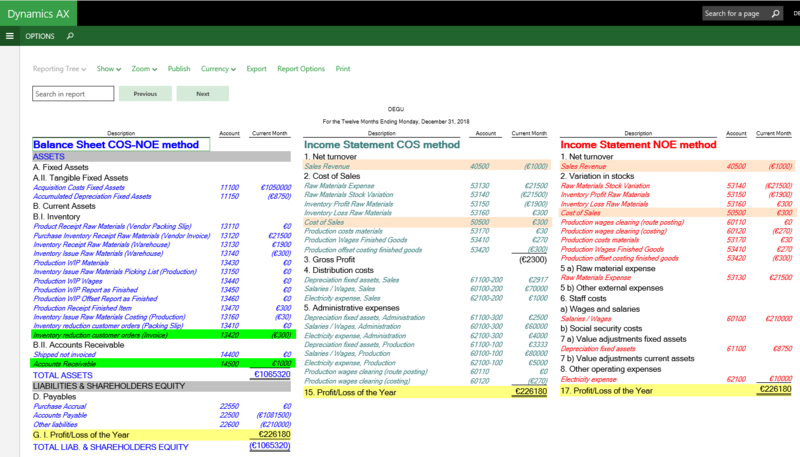 * A second reason for using this specific production posting setup is related to the NOE method as the accounts highlighted in yellow color represent stock variation accounts. The next illustration exemplifies this in detail by showing that those accounts are used “in between” each and every stock transaction. * The lines highlighted in white color in the first screen-print of this section – resp. the orange line in the illustration above – shows the production costing voucher which posts 270 EUR on ledger account 60120 that arose for the assembly of the production item. * As explained further above, from a NOE perspective, this account represents a stock variation and is consequently included in the cost variation section of the company’s Income Statement following the NOE accounting method. * For the COS method reference can also be made to the interpretations from production step 1. That is, the amount recorded on ledger account 60120 represents an amount that allocates costs from the company’s Income Statement into its Balance Sheet and offsets the value increase caused by the production of the finished good. The packing slip transaction for the purchase of the first raw material results in the following voucher. This voucher debits a product receipt account for the purchased material (account no. 13110) and credits the purchase accrual account (no. 22550). 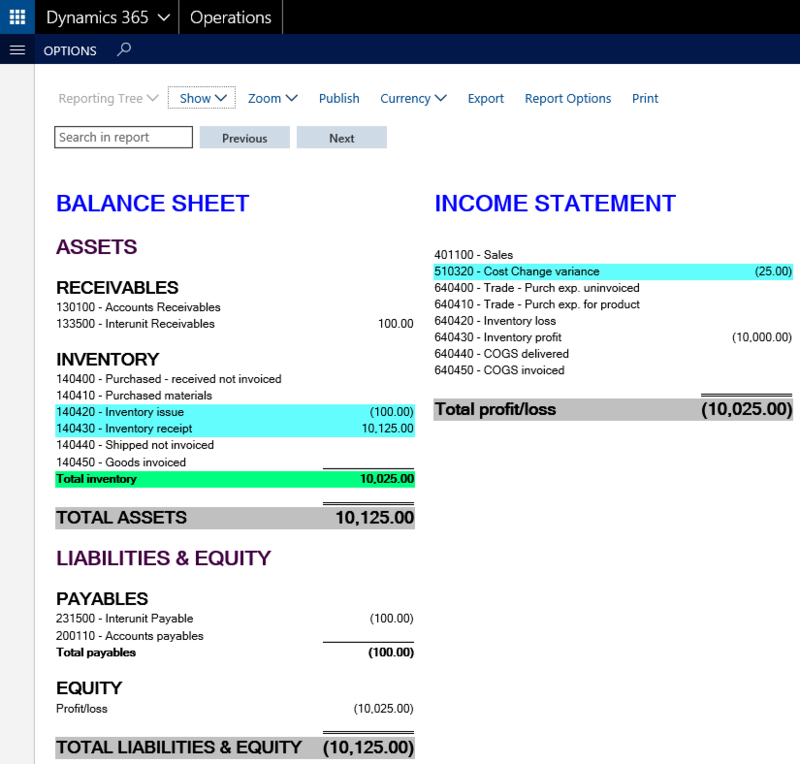 As both accounts are Balance Sheet accounts, no effect on the company’s Income Statement can be identified. The following illustration summarizes the company’s Balance Sheet and its Income Statements according to the COS and NOE method and demonstrates that the packing slip transaction does not affect the company’s profit. The next step in the purchase process is related to recording the vendor invoice. The invoice voucher created does first reverse the previous packing slip transactions. At the same time a stock increase (on account no. 13120) and an increase in vendor liabilities (on account no. 22500) is recorded. Because of the automatic charge code that has been setup, an additional transaction equivalent to the item purchase amount is recorded on the raw material expense and stock variation accounts no. 53130 and 53140. The next two screen-prints summarize the voucher created and show its influence on the company’s financial statements according to the different accounting methods. Note: As the raw material expense and stock variation account are both assigned to the cost of sales section of the company’s Income Statement that follows the COS method, no effect on the company’s profitability, KPI’s, etc. results. The voucher generated with the packing slip posting for the second raw materials purchase is identical to the one created for the first raw material. For that reason, everything that has been mentioned before for the first raw material purchase also applies here. The next screen-prints detail the resulting packing slip voucher and financial statements. As also the invoice voucher for the second raw material debits and credits the same ledger accounts that have been used when the posting the vendor invoice for the first raw material, reference can be made to what has been mentioned above. The only major difference between the first and second raw material purchase is reflected in the invoice voucher. That is, for the purchase of the second raw material the slightly higher purchase price of 12 EUR / pcs. results in a stock increase of 12000 EUR that is recorded on the respective ledger account no. 13120. In line with this stock increase, an equivalent transaction on the raw material expense and stock variation accounts can be identified. For details, please see the postings on accounts no. 53130 and 53140 and the resulting financial statements shown next. The return of the first raw materials that did not pass our quality tests results in vouchers that are – except for the sign – identical to the one’s recorded before. For that reason, reference is made to the previous explanations. What has been mentioned for the packing slip voucher generated also applies for the credit note “invoice” voucher. In this respect I would especially like to draw your attention on the parallel raw material and stock variation posting created for the vendor credit note shown in the following screen-print. 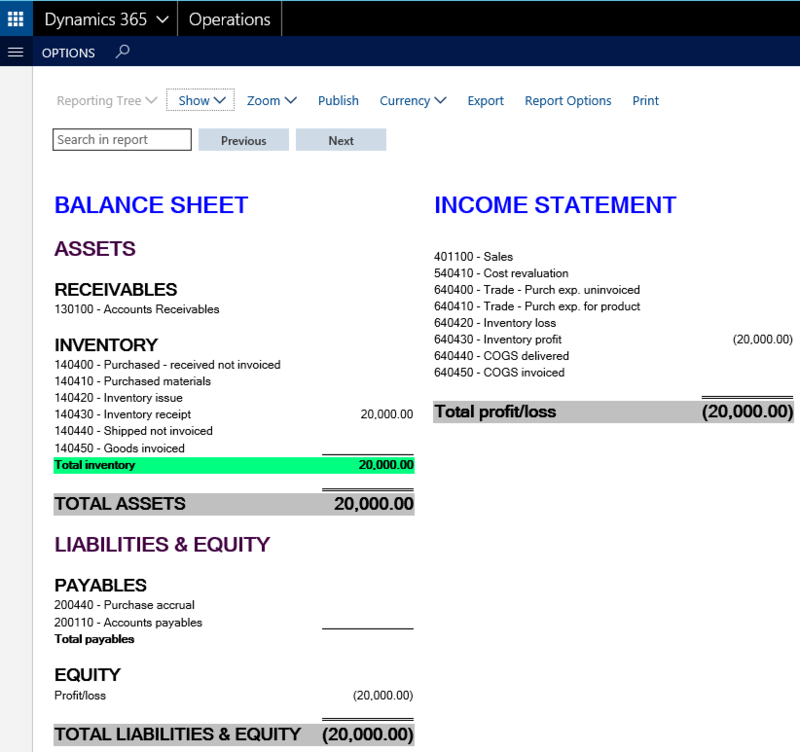 The overall result from all of the transactions recorded within this subsection can be identified in the next screen-print that summarizes the effects of the postings on the company’s financial statements according to the COS and NOE accounting method. 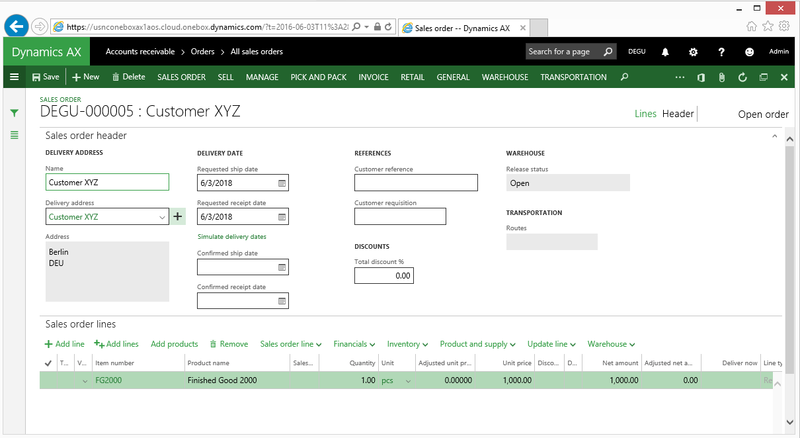 Dynamics AX uses the so-called running average cost price when issuing goods. With the recording of the vendor return transaction such an issuance occurs. As the running average cost price cannot directly be influenced by users and regularly differs from the price that our vendor credits for the item return, a temporary difference between the stock and stock variation accounts might result. In the long-term this (temporary) variance will be offset through the transactions recorded when closing the company’s inventory. However, in the short-term an additional transaction on the “purchase expenditure, un-invoiced” resp. “purchase expenditure for product” accounts might occur. The next screen-prints exemplify such a situation, where the amount credited by the vendor (10 EUR) differs from the running average cost price (11,83 EUR). 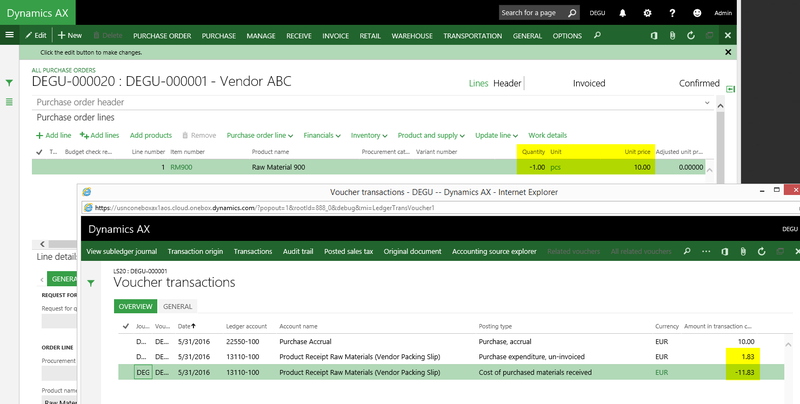 the same ledger accounts in the “cost of purchased materials invoiced” and “purchase expenditure for product” section. 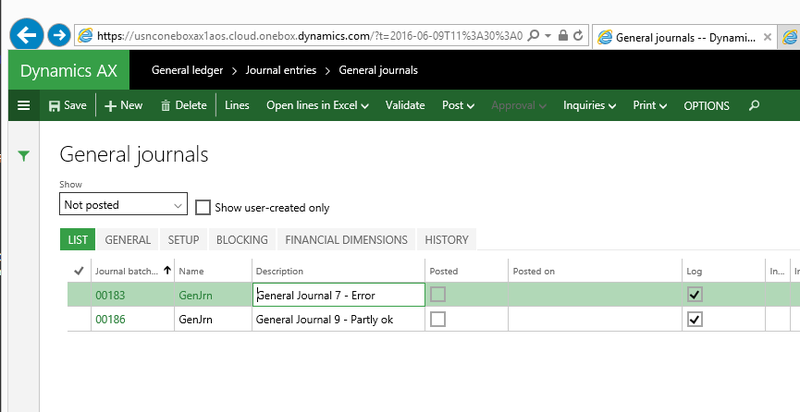 Please note that this setup is not obligatory but can make the analysis and interpretation of transactions recorded in Dynamics AX easier. 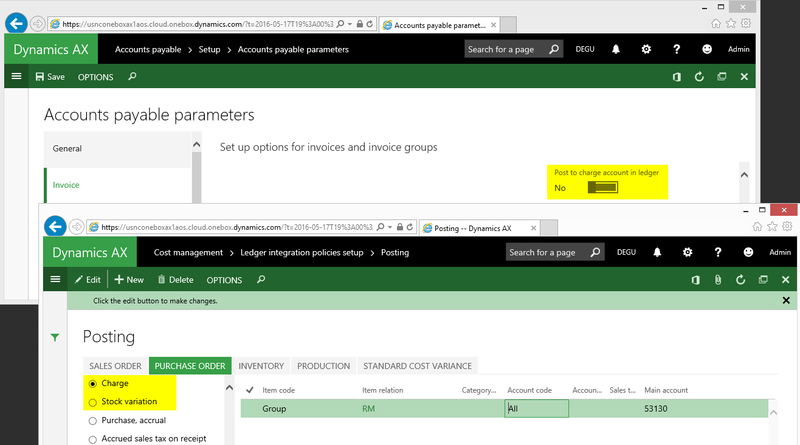 The following screen-print shows the setup just described for the first two account sections mentioned. The following illustration summarizes all ledger postings created within this subsection. Transactions that offset each other are highlighted in grey color. 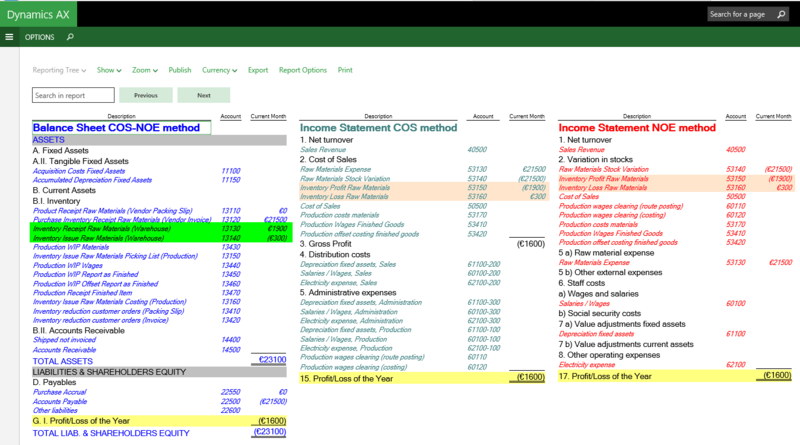 Transactions that do only affect the company’s Balance Sheet are highlighted in green color and the Income Statement related transactions required for the NOE accounting method are highlighted in yellow color. In order to follow up the different transactions, the posting types used have been entered in square brackets just below the ledger accounts used. Tax related transactions are disregarded in order to keep things as simple as possible. 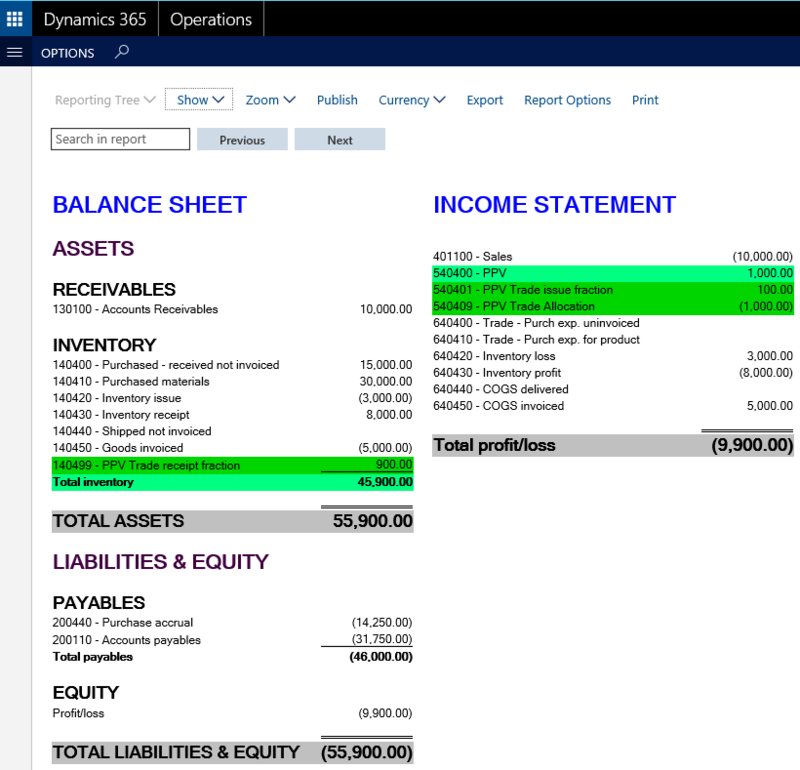 Based on the transaction summary shown in the previous illustration it can be concluded that the COS and NOE accounting methods can be applied in parallel in standard Dynamics AX. In this respect is has been shown that the shortcoming of the standard AP parameter “post to charge account in ledger” can be overcome by using an automatic charge code. International operating companies are often required to prepare financial statements that follow different accounting methods/regulations. Especially local units of international business conglomerates that operate in a foreign country regularly have to prepare financial statement in one format for local accounting standard setters and in a different format for corporate headquarters. In the European Union you will often face situations where companies have to prepare financial statements according to the so-called “Cost of Sales” (COS) Method for corporate headquarters and according to the “Nature of Expense Method” (NOE) for local accounting bodies / tax offices. 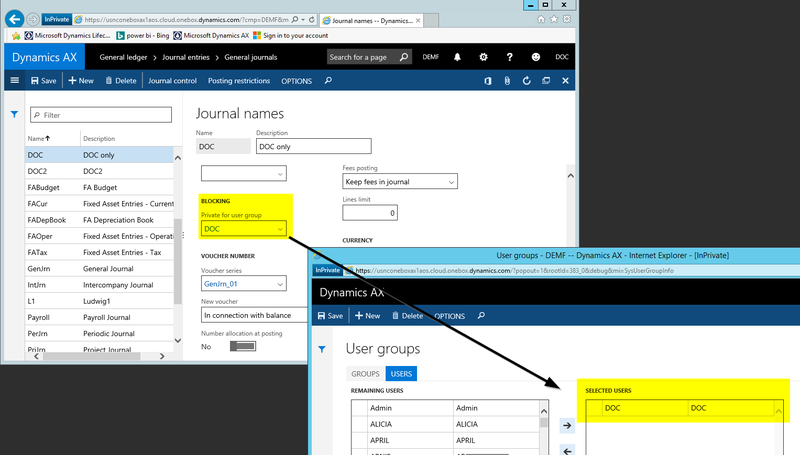 Within the following subsections I will illustrate how both methods – the COS and the NOE method – can be setup in parallel in Standard Dynamics AX. Before digging into details, let’s have a look at the major differences between the COS and NOE accounting method. In the European Union (EU) different regulations are applicable when it comes to the use of COS and the NOE accounting method. As an example, the EU directive 2013/34 specifically describes both methods in detail by referring to the “Function of Expense” (COS) and “Nature of Expense” (NOE) method. Similar regulations can be found e.g. in Germany and Austria where legal regulations detail the differences and requirements of both methods. 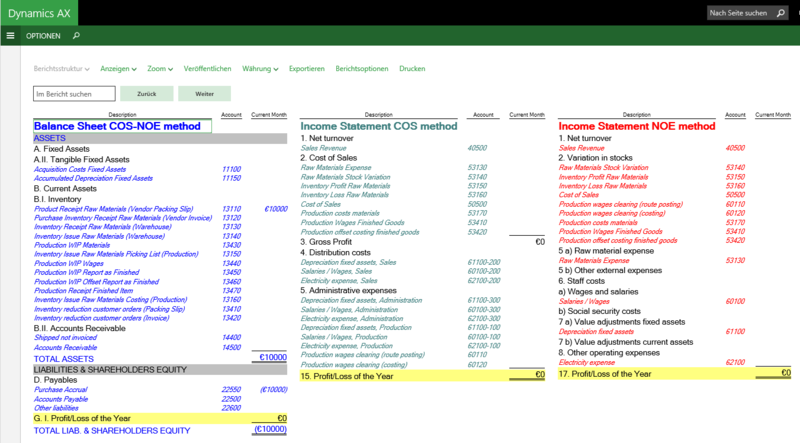 Irrespective of differences in the nomenclature, the major differences between the COS and NOE method can be recognized in the structure of a company’s Income Statement. The next screen-print compares those structures by showing the COS method on the left and the NOE method on the right. Despite the summarized comparison of the different Income Statement formats, major differences can be identified in the inventory, human resource and fixed asset sections. 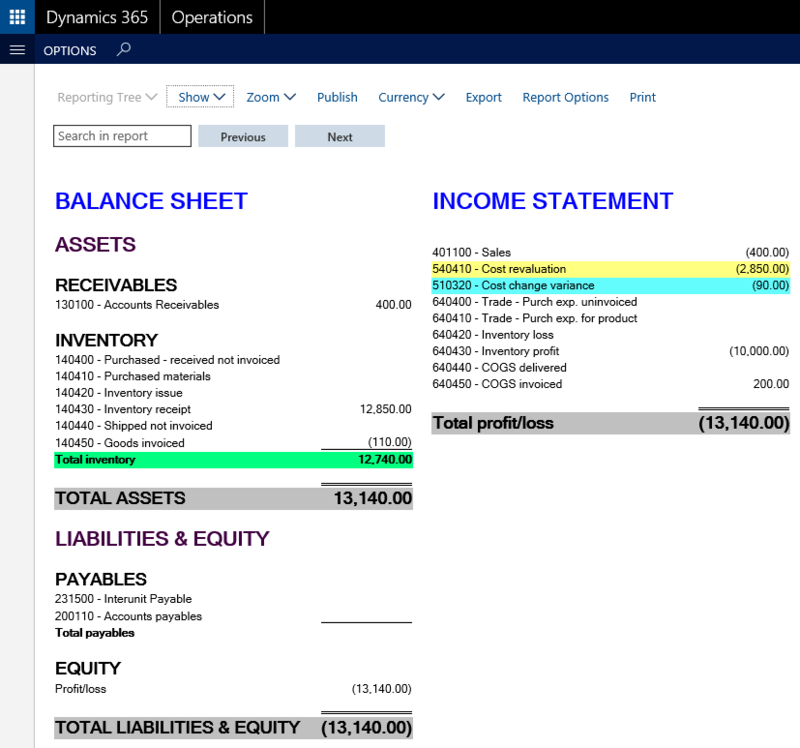 From a finance & controlling perspective, an important difference between the COS and NOE method is related to the data sources required for generating both financial statement formats. That is, while the NOE method does only require data from the accounting department, the COS method also requires cost / management accounting information in order to break down the costs by functions. The next subsection details the sample data used for the illustrations shown in this post. 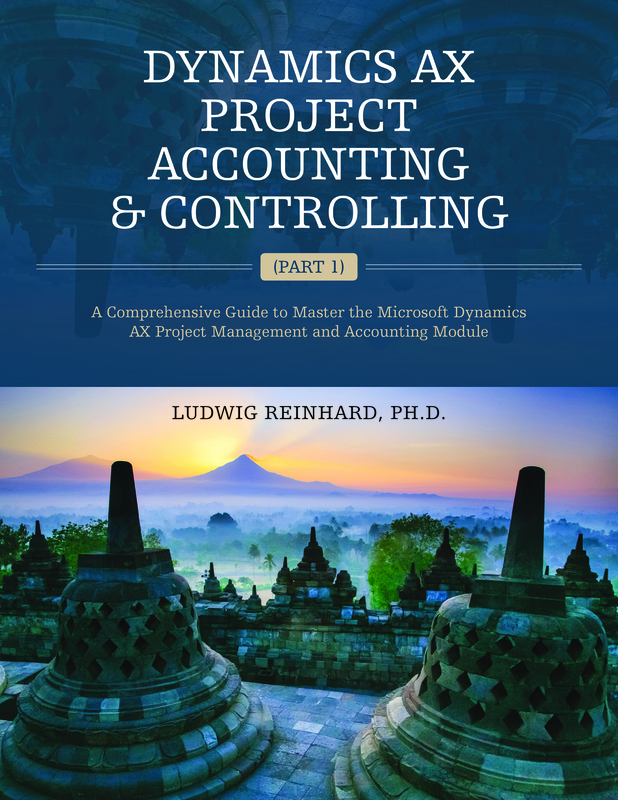 This section is followed by a in depth specification of setups required in Dynamics AX and their effects on corporate financial statements. The process flow that you can identify from above starts with the purchase of raw materials, which are later on partly returned to the vendor (due to quality problems). The next transactions are related to inventory adjustments in the warehouse. Thereafter, several transactions originating from the non-operating/administrative areas will be illustrated before the differences in the production process of finished goods will be explained in detail. The process flow finally ends with the investigation of the differences in regards to the sale of the produced goods. In the following, each of the different colored elements shown in the prior process flow diagram will be analyzed and explained in separate sub-chapters. For purchase related material transactions, the major difference between the COS and NOE method is that the COS method does not affect a company’s Income Statement and thus its profit whereas the NOE method initially expenses the complete purchase of the materials. As a result, the company’s profit instantly decreases when the NOE method is applied. If nothing else happens with the materials (that have been purchased) over the period, the profit reduction is subsequently offset by an adjustment (so-called “stock variation”) transaction. The next screen-print illustrates the differences between both methods just described in an accounting like format. What can be identified from the COS method transactions shown on the left-hand side of the prior illustration is that the purchase of materials does only affect the company’s Balance Sheet (BS). The NOE method related transactions do on the other hand side – at least temporarily and depending on changes that occurred to stock levels over the month – also influence a company’s Income Statement (IS). From what has been said so far, two major disadvantages of the NOE method can be identified. The first disadvantage is that you cannot control and analyze your inventory values within a financial period as the financial inventory values are only correct after the adjustments (“stock adjustment/variation transactions”) have been recorded at the end of the month. The second major disadvantage of the NOE method is that the stock variation postings at the end of the month are typically done on a summarized basis, which prevents you from running detailed item related product Analysis out of the box. 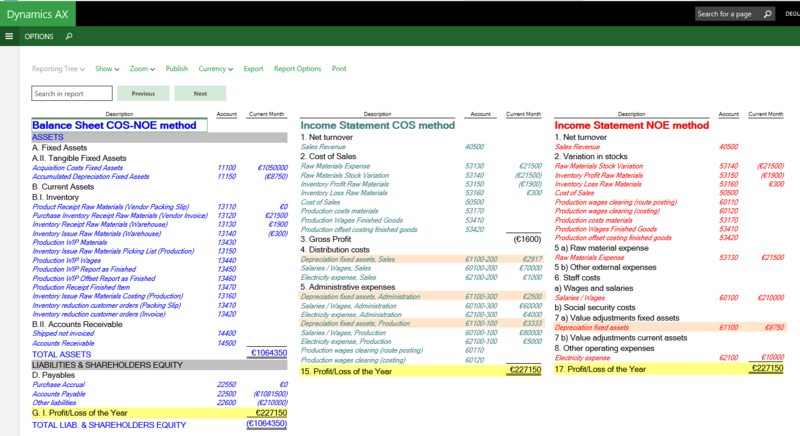 Irrespective of the disadvantages mentioned and against the background of the accounting transactions illustrated in the prior screen-prints, the question arises how the COS and NOE method can be aligned with each other in a way to get both Income Statement formats out of Dynamics AX in parallel? 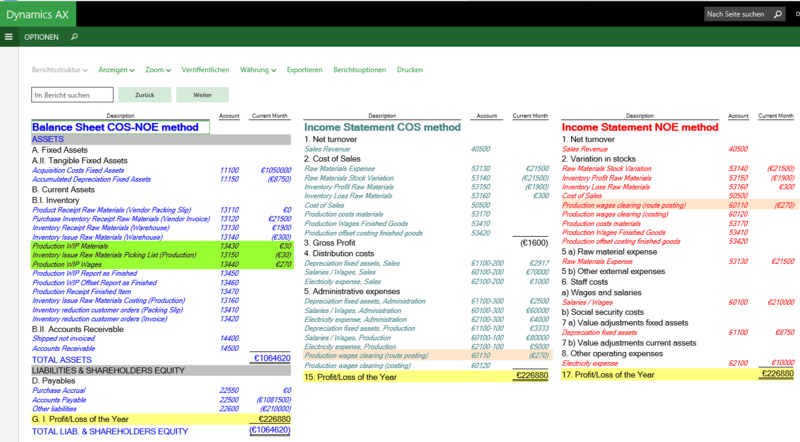 The following illustration tries answering this question by showing you that both accounting methods can be aligned with each other through an additional and parallel expense and stock variation transaction (highlighted in yellow color). Please see the lower part in the next illustration. Given that our company creates two purchase orders – one for 2 TEUR and a second one for 3 TEUR – two additional “stock variation transactions” are recorded. The major difference to what has been explained before is thus the number of stock variations recorded. That is, rather than posting a single “large” stock variation transaction at the end of the month, several “small” stock variation transactions are recorded with each and every purchase. A major advantage of this procedure is that there is no need for a (manual) analysis and recording of stock variations at the end of the month, which frees up some time for doing other things during the often busy month end closing period. Note: The ledger accounts used for the additional material expense and stock variation postings debit and credit Income Statement accounts. As a result, no effect on a company’s profit arises. 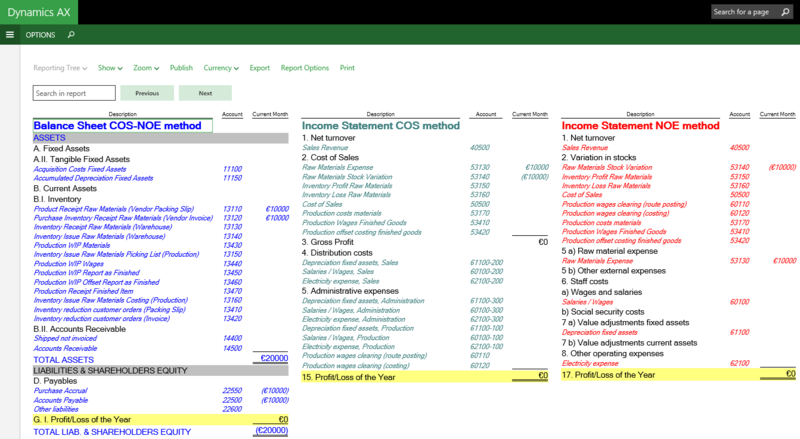 For the preparation of an Income Statement according to the COS method this result thus implies that assigning both accounts to the same Income Statement section will not influence a company’s profitability, KPI’s, etc. After investigating how the COS and NOE method can be aligned with each other in a way to generate the transactions required for both accounting methods, the questions arises how to setup Dynamics AX in order to get those additional material expense and stock variation postings automatically recorded? From a “technical” Dynamics AX perspective, the following two options might help getting those additional postings recorded. The first option makes use of the “post to charge account in ledger” parameter that can be found in the Accounts Payable parameters form. Activating this parameter results in an additional charge (expense) and stock variation posting on the ledger accounts specified in the respective sections of the inventory posting matrix illustrated below. On first sight, this seems to be exactly what is needed for a parallel use of the COS and NOE method. Yet, a detailed investigation of this functionality shows that the additional posting triggered through the activation of this parameter only applies to ordinary purchase related transactions but not to vendor return transactions. Because of this shortcoming, this first setup option won’t be used in the following. Due to the limitations of the first option, an automatic charge code is used instead. The next screen-prints illustrates the setup of this charge code that debits an expense account and credits a stock variation account. 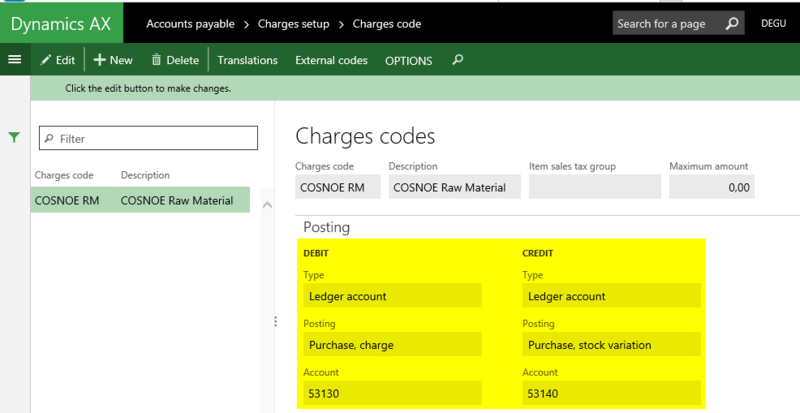 Once the charge code is setup, it is linked to an automatic charge in order to generate an additional posting equivalent to the one created for the materials purchased. This requires that an automatic charge percentage of 100% is applied, as illustrated in the next screen-print. First, on 1st and 2nd January, the packing slip and vendor invoice for the purchase of a first raw material. In total 1000 pcs of the material are purchased for a price of 10 EUR / pcs. Second, on 3rd and 4th January, another 1000 pcs of a second raw material item are purchased. This time the purchase order packing slip is posted with the price the materials were ordered for (10 EUR / pcs) whereas the vendor invoice is recorded with a slightly higher price of 12 EUR / pcs. Finally, on 5th and 6th January, a vendor return order is created for 50 pcs of the first raw material that did not pass quality tests. The following illustration chronologically summarizes the transactions that will be illustrated and analyzed next.